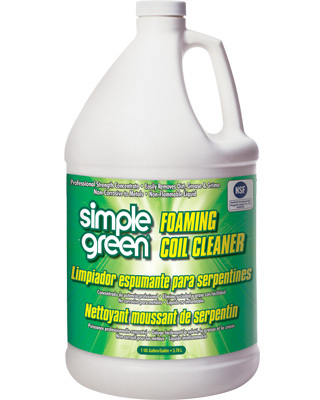 Easily remove tough grease and grime with Simple Green Foaming Coil Cleaner. The professional-strength formula quickly penetrates to remove the dirt, grease and grime that can cause clogs, impede heat transfer or otherwise keep equipment from optimum performance. When sprayed under pressure, the non-corrosive and non-flammable foam clings to even the most hard-to-reach areas. It's self-rinsing on condensate-producing coils making application quick and simple. The formula contains no added colors or harsh perfumes and is NSF registered C1 and P1, making it ideal for use in food processing facilities. Cleans and maintains evaporator coils, condenser coils, fan blades, blowers, heat exchangers, vents, grills, electronic filters, registers and drain pans from HVAC units, refrigerators, freezers and more. Also available in a convenient aerosol can with 360° that sprays in any direction - including upside down.